Migration was made by Hai Ying Wu in 2004. 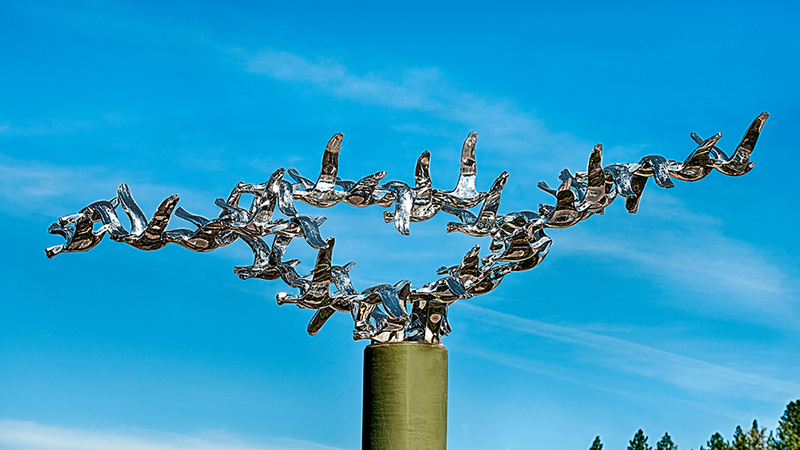 The birds taking flight in Migration symbolize the journey of Central Oregon Community College students on the campus just up the hill. The artist, a native of China, is now a U.S. citizen after he left China follwing the Tiananmen Square demonstrations. Because of the artists’s dual residency, the piece was forged in China, so it’s gone on a migration of its own! Wu also designed the Seattle Fallen Fire Fighters Memorial in Seattle’s Pioneer Square.